GRADIUSIC CYBER's REFLEC BEAT jacket. 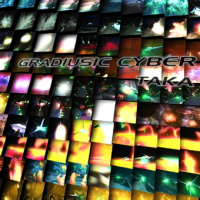 GRADIUSIC CYBER uses samples from GRADIUS, a KONAMI shooter game. GRADIUSIC CYBER has a different sounding ANOTHER chart, which appears as GRADIUSIC CYBER (CLUB ANOTHER VER.) in DanceDanceRevolution 2ndMIX CLUB VERSiON 2. A remix of GRADIUSIC CYBER by BIG-O, titled GRADIUSIC CYBER ~AMD G5 MIX~, appears in DanceDanceRevolution 3rdMIX. Another remix of GRADIUSIC CYBER by dj nagureo, titled GRADIUSIC CYBER -Vic Viper born duv-, appears on dj TAKA's first album, milestone. GRADIUSIC CYBER marks Takayuki Ishikawa's debut in BEMANI. The video used for GRADIUSIC CYBER is the same used for the FMV intro for GRADIUS Deluxe Pack on the Sony PlayStation, Sega Saturn, and Windows95. GRADIUSIC CYBER is one of the only three songs in every beatmania IIDX arcade title, along with 5.1.1. and R3. Of these, GRADIUSIC CYBER is the only song not composed by Reo Nagumo. 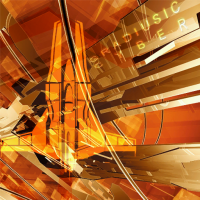 GRADIUSIC CYBER received a brand-new Single/Double ANOTHER charts in beatmania IIDX substream. GRADIUSIC CYBER received LIGHT charts in beatmania IIDX 3rd style. GRADIUSIC CYBER's NORMAL and HYPER charts change their timing windows at the 84.706 second mark, shrinking the BAD and GOOD windows. It is the only IIDX song to change timing windows mid-song. GRADIUSIC CYBER received a Double HEAVY chart in DanceDanceRevolution ULTRAMIX. GRADIUSIC CYBER received new graphics and BEGINNER charts in DanceDanceRevolution UNIVERSE2. GRADIUSIC CYBER could be unlocked in REFLEC BEAT groovin'!! Upper as part of the 9th Set (wac's SELECTION) of the BEMANI MUSIC FOCUS unlock system. It received a new jacket in the REFLEC BEAT series, based on its beatmania IIDX video. GRADIUSIC CYBER is unlockable in beatmania IIDX INFINITAS from November 9th, 2016, after obtaining 4500, 7500, and 8000 BITs for its NORMAL, HYPER, and ANOTHER charts respectively. Aiming to raise the total quality mark, not just in sound but also in visuals, we formed the beatmania IIDX project to pursue synchronization between visuals and interactivity of the highest difficulty level. In regard to this, the trackmaker known as TAKA created GRADIUSIC CYBER; a fusion of KONAMI's symbol, GRADIUS, and the new sensation known as beatmania. We will make various adjustments to the game to challenge the beatmania maniacs and give them something to enjoy. beatmania IIDX difficulty rated from 1 to 5 in 1st and substream, 1 to 7 from 2nd through 4th style, 1 to 7+ from 5th through 9th style, 1 to 8 in 10th style, 1 to 8+ in 11 IIDX RED, and 1 to 12 from 12 HAPPY SKY onward. DanceDanceRevolution difficulty from 2ndMIX CLUB VER. through 5thMIX (and the Solo games) rated from 1 to 9, and 1 to 10 from DDRMAX2 to SuperNOVA2. ※ Denotes chart has been revised from the older/newer AC chart (total notes: 204).